The Southern Utah Museum of Art (SUMA) and Cedar Breaks National Monument are excited to present Chasing Light: Plein Air Festival and Sale the week of July 2, 2017. The call for artists will be open December 1, 2016 through January 21, 2017. Up to 12 Plein Air painters will be selected to paint from July 2 – July 6, 2017, with a wet paint sale and gala the evening of July 7. Art will be exhibited and for sale through August 19. Selected artists will be notified by February 15, 2017. 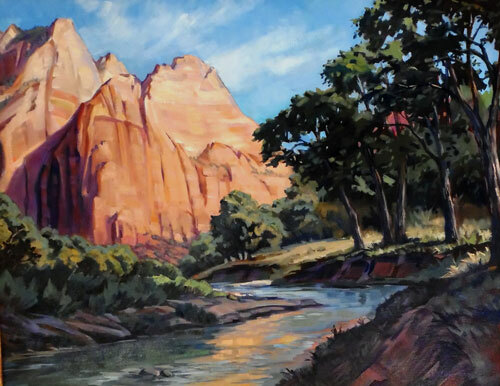 During July 2 – July 6, 2017, the selected artists will be painting at Cedar Breaks National Monument, Kolob Canyon (part of Zion National Park) or anywhere in Iron County, Utah. Completed art will be exhibited salon style and sold at SUMA. Each artist will have a wall that is 8’ wide and 9’ tall. Completed works that don’t originally fit in the exhibition will be stored and used as replacements for sold pieces. Each artist may submit one studio piece to sell during the exhibition. Artists will receive 60% of the purchase with 40% of the proceeds going to SUMA. Prospective artists may enter their information at www.suu.edu/pva/suma/exhibits. Please include three pieces of artwork to be reviewed by the selection jury. For further questions, please send an email to sumafriends@suu.edu.